As an educator and a mom, I am impressed every month with the high quality educational toys and furniture selection available from Guidecraft. As a proud member of the Guidecraft Educators Blog Team, I have the opportunity to introduce you to the best educational products available as well as some fabulous bloggers. 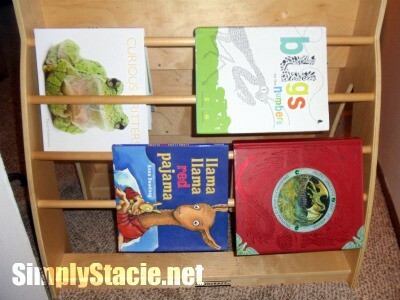 You can even enter a giveaway this month to win a Universal Book Display & Storage system from Guidecraft! The Universal Book Display & Storage system is made of birch ply and is a stylish addition to the school room with practical features including five tiered shelves on one side and the ability to store large sized book on the second side. I am an avid reader and enjoy daily story time so therefore I always have lots of books available for the children who are pre-readers and early readers. Prior to using the Universal Book Display, our book collection would inevitably become a jumbled mess that was not easily accessible by the kids for reading time. Thankfully, the Universal Book Display provides a wonderful book display case that makes it easy to display and store reading material. I appreciate that this book display unit is very sturdy (it is 40lbs) so I do not have to worry about leaving it in the school room for use by children who are ages 4, 5 and 6. It was also quite easy to assemble and I proudly put this together by myself in under an hour. I notice that my children have been independently selecting a much wider variety of books to read because they are able to see all of the books covers and do not have to dig through a mound of books to find the one that interests them. It is also a nice height for younger children and the Universal Book Display has made reading a more pleasurable experience for everyone. 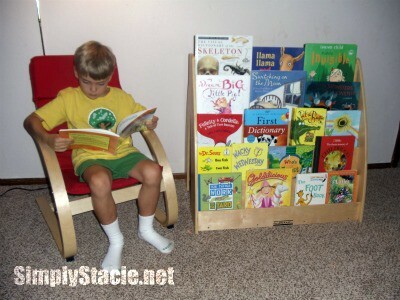 I have purchased several inferior book displays in the past that did not stand the test of time because of canvas that fell apart or wood/plastic that was easily broken. With Guidecraft, I never have to worry about it being a high quality product and in fact it usually exceeds my expectation which is the case with the Universal Book Display. To purchase the Universal Book Display for only $200 or to learn more about all of the educational products available at Guidecraft you are invited to visit their website and browse the entire selection. You are not going to want to miss out on the exciting chance to win a Universal Book Display from Guidecraft by entering the giveaway over at MommyPR! Open to US and Canada. I have been wanting one of those bookshelves for YEARS! I love how the books face forward, making it much more enticing for children!